Walking is a beneficial activity that helps maintain weight and improve the cardiovascular system. It’s especially useful for controlling blood sugar levels. Unfortunately, a simple stroll through the park is easier said than done for those with diabetes. People that suffer from diabetes must take special precautions with their feet. A number of issues can arise from simply wearing an ill-fitting pair of shoes. Diabetes can have a lasting effect on the feet. While proper blood sugar control helps reduce the chances of a problem, they can still arise. The condition can cause nerve damage, slow healing, ulcers, and much more. These issues can eventually lead to infection and amputation. Wearing improper shoes will only hasten these problems. Luckily, there are a number of options to help manage the effects of diabetes. Special shoes help people with diabetes keep their feet comfortable and protected. They are designed to avoid potential issues while taking advantage of the benefits of walking. Here are some of the best shoes for those with diabetes. This boot from Orthofeet is perfect for casual walks or everyday wear. It’s made from textured leather and has a lace closure system for complete fit control. Inside, a carefully designed arch supports the foot. There’s also a gel insole to keep the foot protected and comfortable. It softens the blow on any type of surface, including pavement. It also helps improve stability for a safer walk. The entire shoe is designed to have a comfortable fit that doesn’t bind the feet. 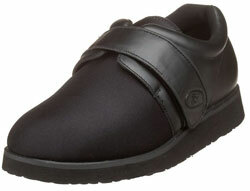 Instead, it provides superior protection against pressure points, allowing anyone to walk with confidence. As a therapeutic shoe, this choice from Dr. Comfort has a variety of great comfort and safety features. The upper is made from a combination of leather and lycra. It uses an adjustable velcro strap for easy use. The strap can be loosened or tightened at a moment’s notice. This allows users to customize the fit throughout the day. Gel inserts are included with the shoes. They create a cushioned layer against the bottom of the shoe. They work to relieve pressure points and keep the feet safe during a walk. It’s available in black or brown. Also from Dr. 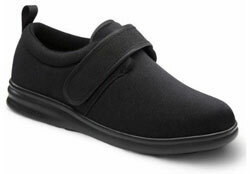 Comfort is this stretchable diabetic shoe. It’s made from lycra and is designed to accommodate swollen feet. In fact, it’s pliable enough to fit braces comfortably. Inside, the shoe is completely lined with soft fabric to prevent chafing. It also comes with supportive inserts. They add thick cushion to the shoe and prevent stress from impacts. The insert and the entire shoe is machine washable. It’s durable enough to retain its shape and features through many washes. It’s a lightweight shoe that supplies heavy protection. Those looking for a high-quality shoe with a bevy of features can look no further than this option from Skechers. It’s a slip-on shoe that’s made from breathable mesh fabric. However, inside is where the shoe shines. The footbed uses Goga mat technology. This keeps the foot cushioned and cozy all day. The midsole uses Resalyte technology for excellent impact absorption. It allows users to walk longer without experiencing the ill effects. There’s also memory foam in the thick heel cup for custom comfort. These shoes are stylish, yet safe to use. The upper is made from soft and durable leather while the sole is made from a thick synthetic material. The padded tongue and lace closure system allow wearers to get a snug fit in two different ways. EVA cushioning is used inside the shoe. 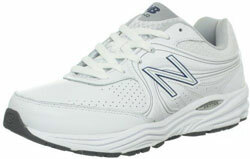 It keeps the foot protected and comfortable with each step taken. The toes are rounded and a bit wider than standard shoes, making them perfect for those that need a bit of extra space. This pair of shoes looks the most like a traditional pair of athletic sneakers. However, it packs a number of great features for those with diabetes. It’s designed to provide a higher instep with the rubber sole shape. It adds more support and helps avoid pressure on the feet. It also has unique ABZORB cushioning in the midsole. 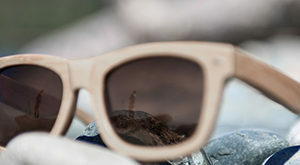 The upper is made from synthetic material. It has perforations for air circulation and mesh material throughout. There’s also a wider forefoot to accommodate swollen feet with ease. 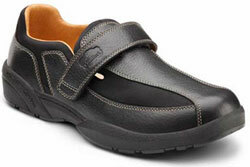 Designed specifically for diabetes sufferers, these shoes have maximum comfort. There’s a double insole to provide twice the comfort and protection. The footbed adds further cushion. It’s removable for cleaning and easy maintenance. The bottom sole is air infused to reduce the force of impact. The upper is made from leather and neoprene for a durable and stylish look. 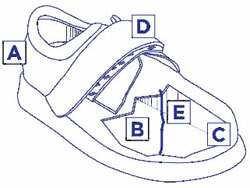 A single strap is used for securing the shoe closed. It’s easy to adjust and provides a snug fit. Mesh lining inside creates comfortable air circulation during a stroll. It’s imperative for all diabetes sufferers to choose the right shoes, especially for walks. However, it’s more important for those that have begun to lose sensation in their feet. Those that have full sensation of their feet and complete control of their blood sugar can often get away with wearing normal shoes for a short period of time. They should still fit properly and be comfortable, but they don’t need to always seek diabetic shoes. Abnormalities in the feet require special shoes. One of the most common types of issues is neuropathy. This condition occurs when the nerves in the feet are damaged to the point that pain cannot be felt. This is dangerous for diabetes sufferers. Without proper use of the nerves, sufferers won’t be able to tell if there’s an issue. They can experience an injury without even knowing it. An additional issue is decreased blood circulation. This causes any injury to heal slower than normal. A simple blister will take ages to heal, giving it more time to develop an infection that may cause bigger problems. One of the biggest problems with bad shoes is the pressure it places on the feet. Inadequate support and protection will allow the force of impact to affect the feet and rest of the body. Continued pressure will eventually lead to an ulcer. With nerve damage, diabetes sufferers won’t notice the pain and keep walking, worsening the trouble. Unfortunately, any type of injury with the feet can intensify over time. The very nature of diabetes makes it difficult for the body to heal itself. Even the slightest blister can lead to infection and amputation. Those with diabetes need to take the right precautions and find a pair of shoes that are designed to provide the safest walking experience. There’s a lot to consider when choosing the right pair of shoes. They need to fit properly and have a variety of safety features. If there’s no sensation in the feet, it’s important to get proper measurements beforehand. Obviously, the fit is one of the most important factors to consider. Shoes should be snug enough to avoid abrasive injuries while loose enough to not cause pressure. Most diabetic shoes are wider at the forefoot. (C) This alleviates the stress on the toes and gives them a bit more wiggle room. It’s also recommended get a shoe that is at least half an inch longer than the big toe. While slip-on shoes and loafers can be very convenient, lace closures are ideal. They provide a more custom fit and better support. When trying on shoes, the main goal is to get an option that fits perfectly at all times. Shoes should be tried on with similar walking socks on. It’s also a good idea to try on options in the afternoon due to swelling throughout the day. When it comes to material, leather is the way to go. That being said, it’s important to go with a soft leather. Thicker options don’t offer much in terms of comfort and can cause blisters with repeated use. The material should be soft and pliable. It should move with the feet at every step. Inside, the shoe needs to have some form of support. Gel or foam cushions are a must-have. Thin leather soles are susceptible to punctures and tears. Not only that, but they don’t absorb the shock of the ground. A thick cushion will decrease the force of impact and reduce the chances of injury with every step taken. Prior to putting on the shoes, the inside should always be examined. It’s not uncommon for people to slip on shoes without realizing that small debris may have fallen into them. This debris can be anything from a small rock, piece of twig, or small toy. They’ll then walk with this piece of debris without realizing it. It’ll cause significant injury and added stress on the feet. Each shoe should be checked before putting them on each time. Those with diabetes can get outside and enjoy a healthy walk to manage their health and blood sugar. 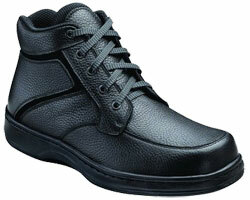 A high-quality pair of diabetic shoes will keep the feet protected and avoid potentially dangerous injuries. While a number of options are available on the market, it’s important for people to consider the options and choose the best choice for their diabetic feet.